Atlanta United will play their first ever match when they take on the New York Red Bulls on Sunday (7:30 p.m. ET on FS1). As is always the case when an expansion team gets underway, people are excited for that opening match, and that’s doubly true for Atlanta, who have showed unmatched ambition in building their first team. And when they play that first match, they will do so in front of a sold out crowd of 55,000 fans. The South Got Something to Say. That Atlanta United sold out the match is no surprise. They have more than 30,000 season ticket holders, a record for an expansion team, and the buzz around the team has been building for the better part of a year. The club set a goal to sell out Sunday’s match and, to this point, they’ve met every goal they’ve set. 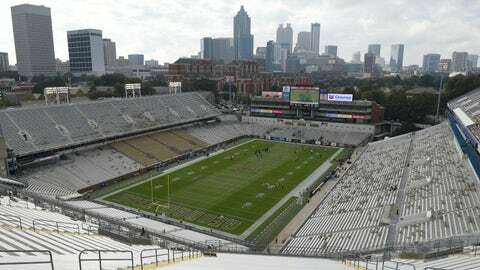 The match will be played at Bobby Dodd Stadium, home of Georgia Tech football. That is where United will play the first half of their season while their permanent home, the brand new Mercedes-Benz Stadium, is finished being built. Once their stadium is finished, they’ll have a 40,000-seat capacity, but Bobby Dodd is bigger and Atlanta United will fill it to the brim.